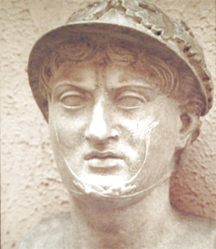 King Pyrrhus of Epiro, a region of northern ancient Greece. In 280 BCE, he led an invasion of southern Italy, in what would become the first engagement for the Romans with a then-modern Hellenistic armed force. In that year and the next, he won two major battles, but the cost in arms, men and elephants was so high that he is said to have remarked, "One more victory over the Romans and we are completely done for." At least he maintained his sense of irony, if not humor. These victories were the first to be called "Pyrrhic," though certainly Pyrrhic victories occurred earlier, and they would continue to accumulate throughout the history of warfare. Pyrrhic victories also occur on a daily basis in most organizations where people resolve conflicts of a somewhat less bloody kind. Photo of a piece held at Museo della Civiltà Romana (the Museum of Roman Civilization) in Rome. Groups facing divisive issues risk making serious mistakes unknowingly. In group cultures accustomed to voting, formally or informally, people tend to measure the strength of alignments in terms of headcount. This perception obscures the passion people feel about the issues at hand, and it can lead us to make avoidable errors. Here are some insights about divisive issues. Whatever the actual numbers on any side of a question, they don't measure the intensity of feeling of group members. That intensity can determine how well the group works together after the decision. Consider how you would feel if you were one of those whose strong feelings the majority discounted. Work hard to devise a solution that excites no strong feelings of rejection on the part of any group member. Making choices about divisive issues creates consequences for group cohesion. Focusing only on the content — the issue itself — and failing to consider the feelings of those who disagree is a risky approach. As a group member, include both content-related matters and the consequences for the group as you consider your choices. A legacy of bitterness and alienation can undermine the outcome you desire. After the decision, the passion people felt changes in different ways, depending upon whether the passion favored or opposed the decision. The passion of those who favored it is more likely to abate; the passion of those who opposed it is more likely to intensify. If the chosen solution excited strong contrary passions, beware their ongoing intensification. Prepare by finding ways to defuse the tension, possibly with other decisions in related areas. your choicesthose about to prevail to "consider the consequences of narrow victory," can sound like threats or blackmail from disgruntled losers. Advice to those who opposed the decision to "put your feelings aside and move on," can feel like a fresh insult. The urge on the part of one party to advise the other to surrender or relent is actually an index of the poverty of wisdom in the decision itself. Would you like to see your comments posted here? rbrenWjzYjNiGkZaVOTJHner@ChacPPDLthvqWgtefvMGoCanyon.comSend me your comments by email, or by Web form. See also Conflict Management and Effective Meetings for more related articles. I offer email and telephone coaching at both corporate and individual rates. Contact Rick for details at rbrenubqGBrlESJJkXhxener@ChacMXYUuAjJlqPAOEmJoCanyon.com or (650) 787-6475, or toll-free in the continental US at (866) 378-5470.